AN APPEAL TO THE BENEVOLENT. 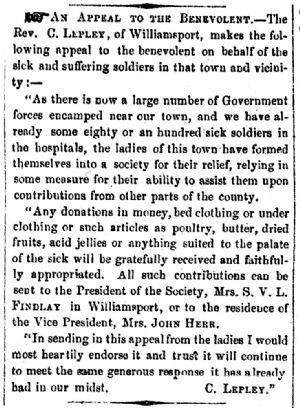 "As there is now a large number of Government forces encamped near our town, and we have already some eighty or an hundred sick soldiers in the hospitals, the ladies of this town have formed themselves into a society for their relief, relying in some measure for their ability to assist them upon contributions from other parts of the county. "Any donations in money, bed clothing or under clothing or such articles as poultry, butter, dried fruits, acid jellies or anything suited to the palate of the sick will be gratefully received and faithfully appropriated. All such contributions can be sent to the President of the Society, Mrs. S. Y. L. Findlay in Williamsport, or to the residence of the Vice President, Mrs. JOHN HERR. "In sending in this appeal from the ladies I would most heartily endorse it and true it will continue to meet the same generous response it has already had in our midst. C. LEPLEY."